Hello from Klingle Valley! We've had a very productive spring so far, and we're looking forward to continued progress in the warmer months. Let's take a look at what we've done since our last construction update. The project reached its first major milestone last week with completion of stream restoration work along Klingle Creek. The in-channel stream work required five months of challenging excavation, utility relocation, selective tree removal, and stone structure installation. Stream restoration truly is the heavy lift for the project, and its completion now allows us to start work on the trail. You may recall from previous updates that the stream restoration work was divided into four segments, shown in the graphic below. Work in Segments 2 and 3 was relatively minor and dealt with stream flow speed rather than erosion control. Segments 1 and 4 are where erosion repairs and channel widening took place, and the transformations are immediately noticeable. Below are recent photos of the restored Klingle Creek, starting in Segment 1 between Cortland Place and Connecticut Avenue. The banks of Klingle Creek that were once eroded up to 8-9 feet high have now been rebuilt with stone walls, and tiered, vegetated soil lifts. The channel's smooth bed that often flash flooded during rain events is now a series of gently descending step pools. Also, thanks to relocation work by Washington Gas, the gas line behind the Woodley Park Towers that was exposed in the creek for years has been removed and the stream bank has been stabilized with a stone wall. Looking at Segment 1 in its restored state, it is hard to remember how Klingle Creek looked before construction. Here are a few before and after comparisons. Segment 4 restoration work included both erosion repair and channel widening east of Connecticut Avenue. This is the area where Klingle Creek was once channeled into a series of underground pipes that routinely clogged and flooded Klingle Road. With a smaller footprint required for the future trail, we were able to construct a channel that follows the natural flow path through the Klingle Valley. In the photos below, you can also see how new vegetation will develop along the stream banks, with small trees (known as live stakes) planted at the immediate edges of the banks and larger tree species planted higher up on the banks. Again, here are your before and after photos, this time in Segment 4. In non-stream related construction updates, we've also started work within the Porter Street Interchange. This includes construction of the trail/sidewalk that will connect the Klingle Valley Trail to the Rock Creek Multi-Use Trail. The contractor will also install water quality structures along the new trail and sidewalk. Constructed in cooperation with DC Water, these structures will separate silt and other solids from runoff to reduce pollution in Rock Creek and beyond. Washington Gas also continues with its gas main relocation work along Klingle Road. 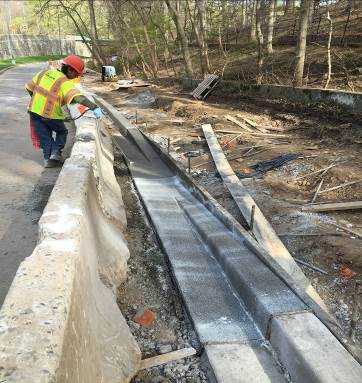 In recent weeks, Washington Gas, in cooperation with KVT contractors Anchor Construction and EQR, constructed a new gas lateral feed to the National Zoo just south of the project site. As always, utility relocation work is a daily challenge, with existing underground structures and other utilities always where you don't want them, as you can see below. To close, here are two wildlife photos from the project, taken by our Stream Restoration Inspector Ricardo Gonzalez of Straughan Environmental. Thanks to our stream restoration contractor Environmental Quality Resources this photo of Klingle Creek's newest residents. We discussed in the December 30th progress update that some of the trees removed for the new stream channel were reused to construct these root wad structures. This is a great example of the habitat that root structures provide within the creek.